Our Stittsville Program, which opened in September of 2006, is a welcome addition to the range of children’s services that Andrew Fleck Children’s Services offers. Our program is located at 40 Granite Ridge Dr., adjacent to the Stittsville Public School. Our purposely built space, attached to the Stittsville Public School provides a wonderful environment for our Preschool children, ages 2.5 – 4 years of age. Our kindergarten program is licensed for 78 spaces for children attending junior and senior kindergarten and our school age program has 110 spaces offering care to children in grade one to grade six. With the implementation of Full Day Kindergarten at Stittsville Public School, we are now providing the extended day component to the full day. The Centre is open Monday to Friday; from 7:00 a.m. to 5:30 p.m. Our Preschool and Kindergarten programs operate for 12 months of the year. Our School Age Program operates the same as the School Board Calendar. 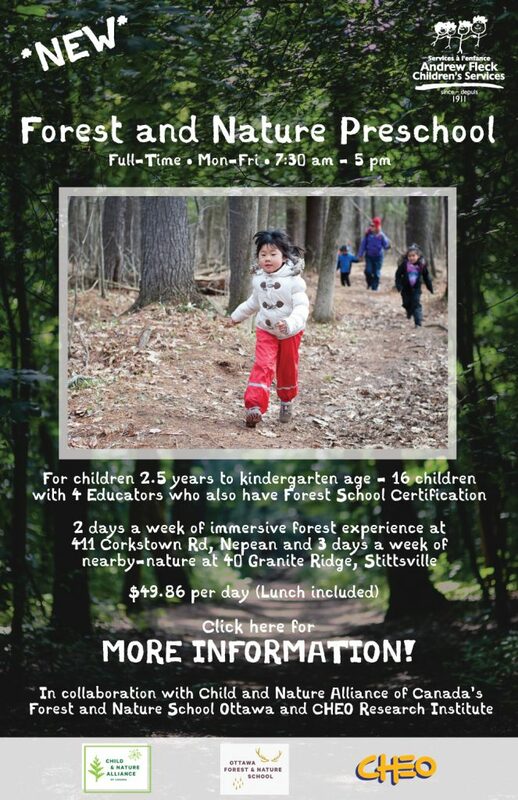 The onsite Program Coordinator and full time teaching staff all have Early Childhood Education qualifications or a recognized equivalency, are registered with the College of ECE, and hold valid First Aid and CPR. Our staff are dedicated, professional and eager to welcome your child into our fun learning environment. The Stittsville Program is closed on statutory holidays.